Update at 2:56 p.m. ET: Apple has corrected the version of the app in the App Store. If you haven’t updated to the new version of Find my iPhone currently in the App Store, don’t—unless you’re a developer. 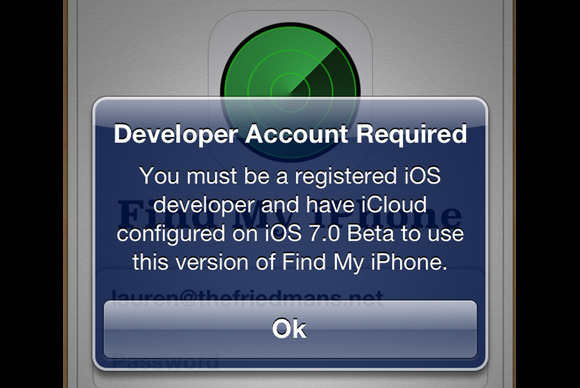 Version 2.0.3 of the app, which Apple released Thursday, purports to include only “bug fixes and stability improvements.” But when you update the app for locating your iOS devices, and log back in, you’ll get greeted with an error indicating that the app is limited to registered iOS developers running the iOS 7 beta. Whoops! The updated version of the Find My iPhone app sports an icon more in line with the design of iOS 7 than iOS 6. It seems as if the version released in the App Store simply got pushed too early. Apple declined to comment to Macworld, but did point to the now-updated version of the app.